New Dress Uniform For General Sarge! 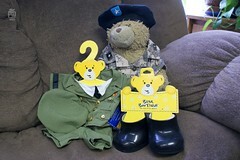 From Build-A-Bear – A New Dress Uniform! Before I do anything else in this blog post I need to give a huge special thanks to Molly Saunders. Molly is the Digital Community Marketing Bear for Build-A-Bear and she’s taken quite an interest in the daily chronicles of General Sarge. She contacted me via Twitter early on as I started posting these daily pictures of General Sarge. One of the first things she said was “Thank your son for his service”. I have to admit, that touched my heart. I’m also honored and humbled as we hear from people we don’t even know telling us to “thank our kids for their service”. One day last week I received a Direct Message from Molly on Twitter asking if I could send her an email with our mailing address in it because – she said – “We’d like to send General Sarge a little gift”. The gift arrived and General Sarge is thrilled! A Package for General Sarge! Yesterday was a pretty big day for General Sarge. 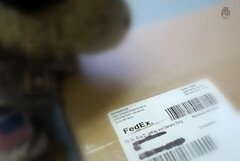 Not only did we get mail from Ben again, but General Sarge even got a FedEx package addressed to him! As you can see he was quite excited and had to have a close up look when I told him his name was on the box too! Check it out! General Sarge is getting a close up look at the label that says to Dr. Rus Jeffrey and General Sarge! Of course neither of us could contain our excitement as we wondered what in the world was coming to him in such a big box. Not only a box, but special delivery via FedEx! We opened the box and found a great surprise…. 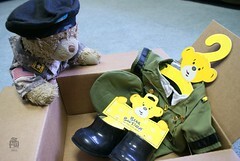 A new uniform from Build-A-Bear! Now General Sarge is ready for anything. He has his camo uniform and for those special occasions he now has a dress uniform. These Build-A-Bear people think of everything. General Sarge is a One Star General and yes, his dress uniform has the single star on the shoulder too! I think he was really excited about the nice shiny shoes! Look the shine on those! It was all I could do to contain General Sarge’s excitement as he jumped up on the couch to pose for this next picture too. If you look real close – I think he’s smiling! Honestly, when I started this pictorial journey with General Sarge while Ben is away at Basic Training at Fort Benning, GA I had no idea it would take off like it has. There are many exciting things going on and I’d like to thank all of those who take the time to comment on these posts and encourage us. We are very proud of Ben and Ryan who ships out for his Basic Training at Fort Jackson in February. Once again thanks to Molly and everyone else at Build-A-Bear. General Sarge, PVT Benjamin Jeffrey and yes, my wife and I all give you a great big salute! View Larger Pictures on Flickr Here! 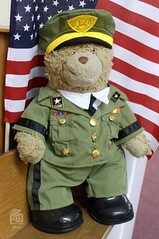 This entry was posted in 2011 General Sarge Posts and tagged Army, Army Strong, Build-A-Bear, General Sarge. Bookmark the permalink. I have worked with a lot of companies from my blog, and I am extremely impressed with build-a-bear that they would send a gift and thank you for your service!! That is an amazing company. I love General Sarge’s new outfit! I can’t wait to see what special occassion he wears his uniform for!! Yes, the Build-A-Bear people have been awesome with this. In what started out as a way for me to keep busy while Ben is away, has turned into such a joy with many surprises.